Testing a new design is always a true joy. How will it fly, has it been put together good enough, how to get the bridling correct, will it be a success or a “grass” kite? All these questions and the fun of making a new kite keep me happy for hours. 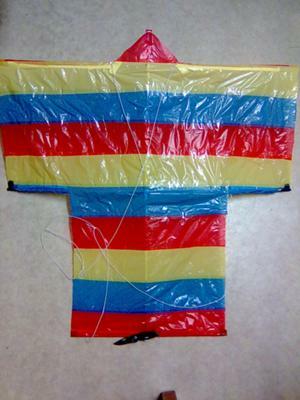 After the kite has been made, you just have to wait for a good breeze. After half an hour struggling to get the kite airborne I was on the brink of having a total breakdown. Of course people were walking by with smiles on their faces, seeing me pleading with the kite to fly. Trying shifting the attack angle and fitting a tail did not help. Okay, one last try before going home, and wonder of all wonders, the Sode starting to catch air like it was ready to fly. Realizing that I have been shifting the attack angle too much I carefully just moved the knot some mm each new try. And now things started to happen fast. Suddenly the Sode rises straight up and it is flying like a dream. My 50 meter flight line did just rush trough my fingers and let the kite fly at good 80-90 degrees. Now I started to have problems with my neck looking straight up all the time. Taking time to look around I could see the obvious, not a single person was left to see the beauty and “skill” of my kite making. Pulling hard the kite was full of life. Now a thought hit me, how high was the kite ready to go? Getting the kite down was a struggle, it did not come voluntary, I had to pull it down with considerate force, getting the most line when the kite passed straight over my head. Shifting to a longer line, a nylon fishing line, I let the kite free again. Not prepared for the rush, I lost the grip of the winder and the Sode shoot straight up and away. With one hand gripping the line and the other trying to catch the winder, I lost sight of its climb. 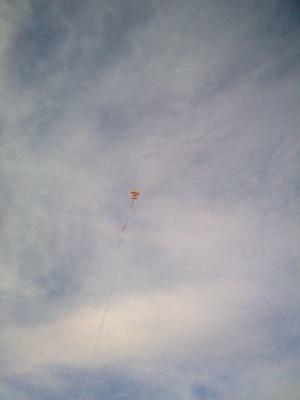 Finally I got the winder under control and could see how the kite just soared above me. MMM… pure joy! Since I started building kites at the tender age of 47, I have never been scared flying kites but now I felt that I did not have total control. The kite pulled with a force that made it clear that the line could break, and I also did not want to lose the kite. Trying to get some more meter of flying line on to the winder I felt how hard it was too retrieve just some back. The sound of the line rose each time I pulled on it, threatening to break. Slowly, hand over hand; I shortened the line and at the same time walking in a zigzag pattern so the line would not tangle, the kite gradually came down. Half way down a seagull flow past the kite, and was near tumbling in the air with surprise of seeing the “strange bird” in the sky. At last, the Sode gently landed on the ground with me exhausted. Going back to my starting point I rewound all my flight line. Calling it a day I and “HighFlyer” went home. Comments for My new Sode kite. Let's see if it inspires a few others to try the Sode.